This page allows a Citizen of the United Kingdom to purchase a Multiple Entry Business Visa for Bolivia. Maximum Stay: 180 days The maximum stay refers to the total amount of time that you can remain in the country during a single visit. For longer stays, you would either need to consider a residents visa or leave and re-enter the country using a multiple visit visa. Processing Time: 5 business days The processing time is how long the visa would usually take to be obtained from the point at which we have received all the required documents to process your order. It does not include the time needed to post your document(s) to us or for them to be returned to you. As part of your Bolivian visa application, you will required to visit the Bolivian Embassy in London. During your visit, you will be required to pay the embassy visa fee. Once your application has been completed, we will collect your passport and check everything is correct, before returning it to you. Liaison with the Bolivia Embassy in London for any queries and attendance where required. No more wasted time for you on the phone or in line at the Embassy. Collection, Check, Scan & Dispatch of your completed Bolivia Visa. Let us make sure everything is as expected for worry-free travel. Whilst Vital Consular is not affiliated with the Bolivian government, we have been working with the London Embassy network since 2008. You don't have to put up with unanswered calls and long queues - we do that for you. For this, our prices include a service fee to handle your Bolivia visa. 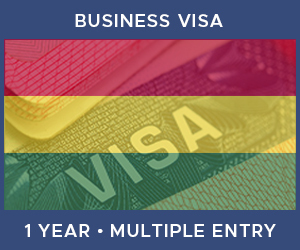 In order to apply for a Bolivia Business Visa you will need to supply a number of items. Click on any of the icons below to learn more about each one. For this visa, you will be required to have a police clearance certificate as evidence that you do not have a criminal record. You must provide evidence that you have the funds to cover all expenses while in the host country. This must be in the form of your bank statements over the previous six months. If someone else is funding your trip, then they must write a letter stating this is the case and attach their bank statements over the previous six months.